Google Blog Search's homepage has been updated and it now includes a list of popular stories, which are categorized and clustered similarly to Google News. 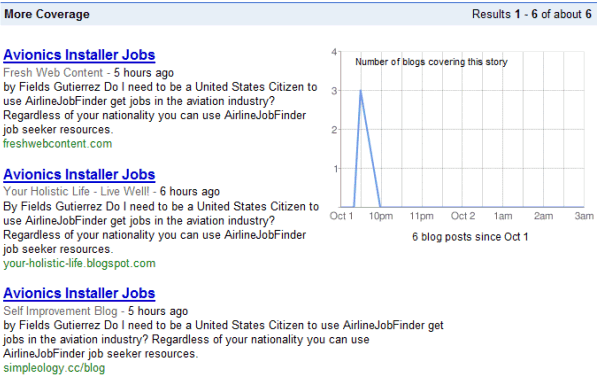 "Blog Search uses a set of algorithms to try to determine the most popular stories in the blogosphere. We consider factors such as a blog's title and content, as well as its popularity throughout the rest of the blogging community. Then we display groups of posts that are closely related," explains the FAQ. It seems that Google Blog Search didn't select some authoritative blogs to be listed on the homepage and almost any blog post could be included in a Blog Search cluster. There are 11 categories: politics, US, world, business, technology, video games, science, entertainment, movies, television and sports, but they aren't equally represented. Unfortunately, Google is not able to detect spam posts, plagiarism, forums or blog comments. 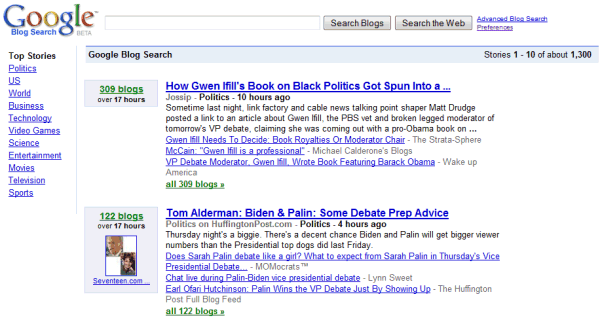 Google Blog Search doesn't provide yet feeds for the top stories and the search results aren't clustered. 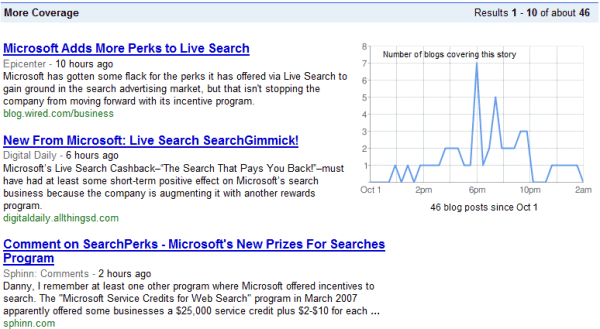 The new Blog Search homepage is a decent alternative to the technology-focused Techmeme and to Technorati's front page. Hopefully, Google will filter the low-quality posts and it will integrate the service with Google News. well, a nice change but still I like Technorati more..
a nice change but still I like Technorati more..
Hopefully the algorithm gets more in depth so it can ensure that the most relevant posts are shown first.